Today has been gray and drizzly. 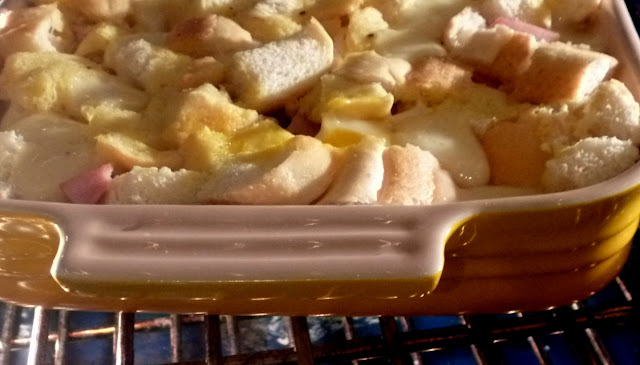 Although I generally don't like to bake in the summer, it just seemed to be the perfect day to make one of my favorite egg dishes - bread pudding. 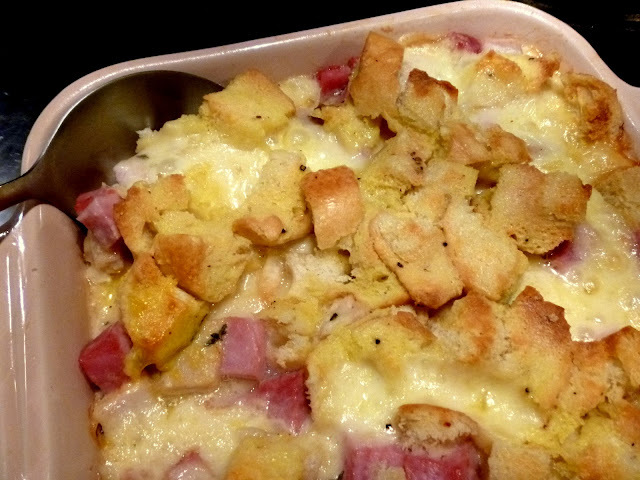 This Monte Cristo Bread Pudding is unique in that is a savory bread pudding instead of a dessert. A perfect rainy summer evening meal. Whisk eggs, cream, milk, and mustard, salt and pepper in a 2 Cup measuring cup and set aside. Butter a 13"x 9" casserole dish and arrange the bread cubes in a single layer in the dish. Layer the meats and cheese on top of the bread. Sprinkle thyme over top, then cover with the remaining bread. 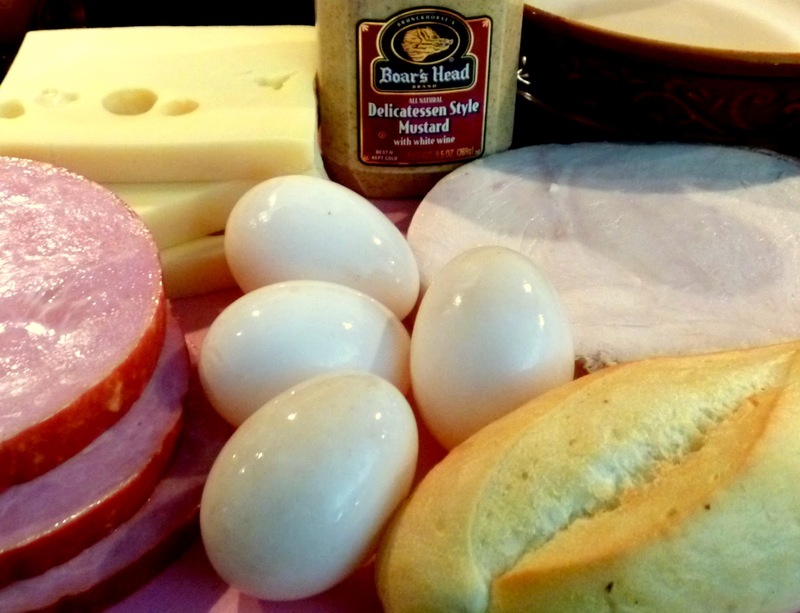 Carefully pour the egg mixture over the top, making sure to moisten all the bread. 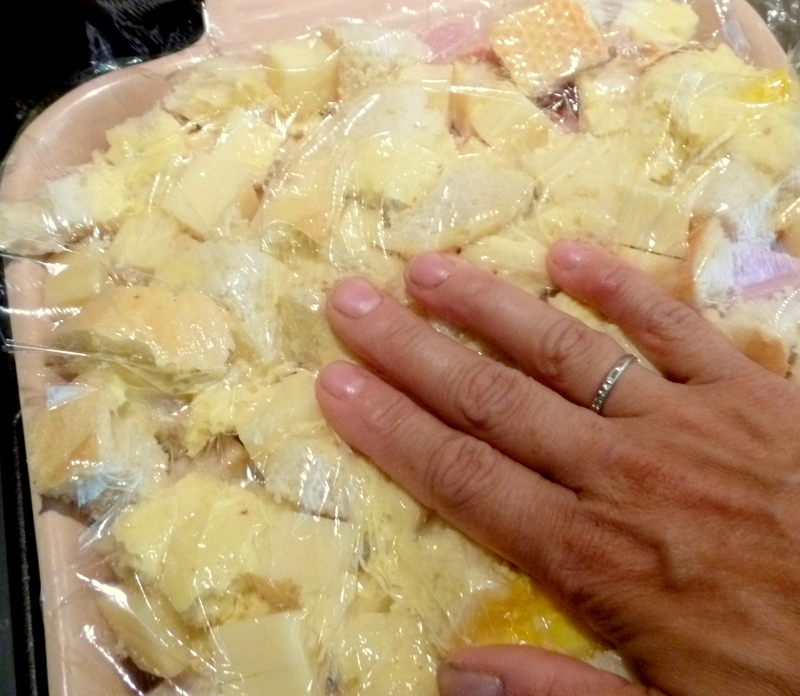 Cover with plastic wrap, pressing down to soak the filling and refrigerate for at least 6 hours or overnight. Bake at 350 degrees for 20 minutes, then remove from the oven, brush top with melted butter and return to oven for another 25 minutes or until cheese is bubbling and top is golden brown. Serve immediately with a nice cold glass of crisp Chardonnay, light a few candles and enjoy the rain! 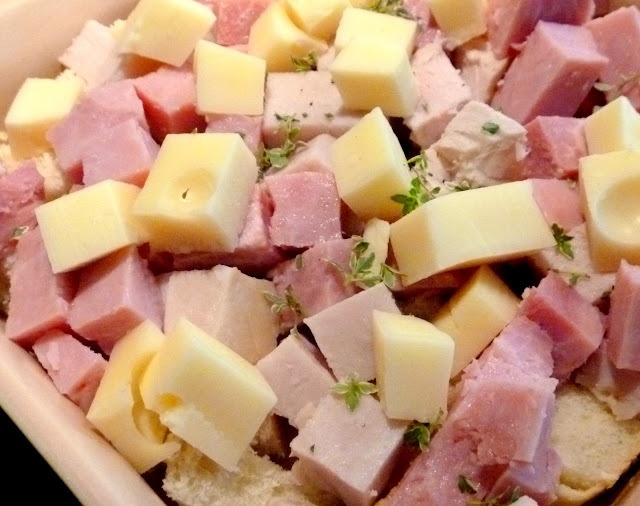 Turn a classic Monte Cristo sandwich into a hearty savory bread pudding. 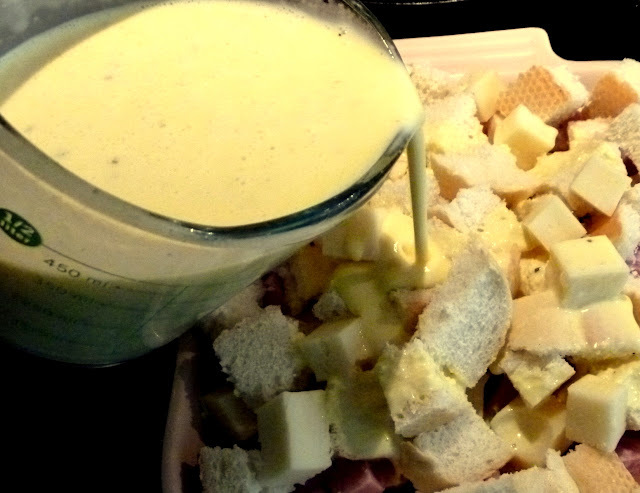 Carefully pour the egg mixture over the top, making sure to moisten all the bread. Cover with plastic wrap, pressing down to soak the filling and refrigerate for at least 6 hours or overnight. Serve immediately. Leftovers can be refrigerated, covered, and the reheated in the oven. Facebook | Twitter | Instagram | YouTube| Subscribe ©2012 by Fresh Eggs Daily, Inc. All rights reserved. Yum! Going to do the Summer Tomato Pie first!!! Thanks for the recipe! 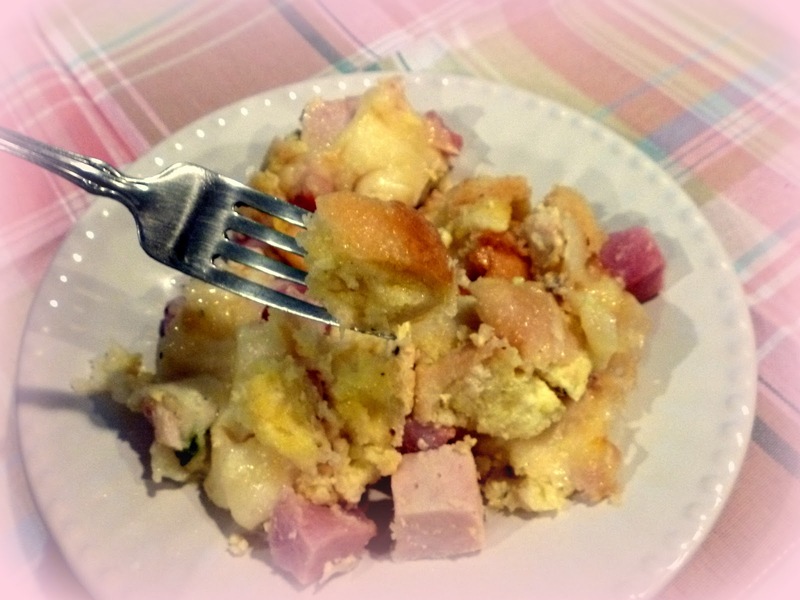 You made making Monte Cristo Bread Pudding seem so simple! Would you join us in our food community www.mycookbook.com and let us know how you worked on the Monte Cristo Bread Pudding perfectly ? Bread pudding is easy! I make a few different kinds, all the same basic recipe. I appreciate the offer, not sure I have the time to add anything else to my plate right now but I'll check it out. Thank you. I love Monte Cristo sandwiches and this looks divine! Can't wait to try. I'm pinning this one. We are happy to be your newest followers. Thanks for linking to the Weekend Potluck!